Festuca 'Siskiyou Blue' is an evergreen grass that forms a neat clumping mound of silvery-gray foliage. Siskiyou Blue fescue is a particularly striking, evergreen ornamental grass. It has slender blades of electric blue foliage that shimmer in the sun. It forms a neat clumping mound of foliage that's about 10-12" tall and 15" wide. Blue-green flower spikes bloom in summer on slender, upright stems that are about 4-5" taller than the foliage. The flowers mature to tan. Planting Siskiyou Blue in full sun really brings out the color of the foliage. However, it's also tolerant of dappled shade. 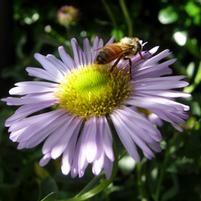 Siskiyou Blue is tolerant of most soil types including clay. It prefers good drainage, but will tolerate short periods of waterlogged soil if necessary. 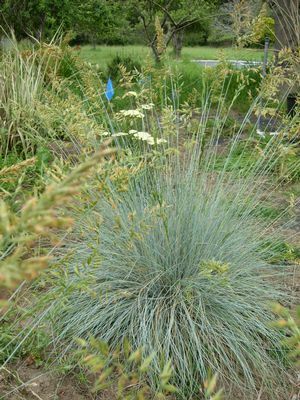 Once established, Siskiyou Blue fescue is drought tolerant. On the coast, it'll survive with no summer water. However, it will look better with occasional watering of the whole root zone, perhaps every three-four weeks. In hotter areas, we suggest a deep watering every two-three weeks. Siskiyou Blue tolerates the heat of California's central valley where it can be planted in full sun. However, it needs extra water to be happy and look good. It's probably happier in hot areas with morning sun, late afternoon sun or in dappled shade. It survives winter temperatures as low as 15°F. 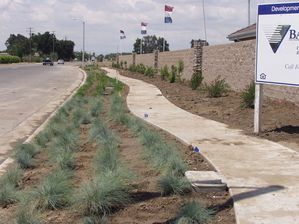 Some nurseries are selling this grass as a California native selection of Idaho fescue (Festuca idahoensis). However, it's thought that it's actually a hybrid grass and has some European parentage. Siskiyou Blue's really stunning when planted in groups. For an eye-catching display, combine it with yellow, burgundy and lime green.